I rather think this may well be me, apart from the fact that I'm not a tiny urchin. Otherwise, it's uncanny. I think I would wear the same disgruntled look too. He knows any moment, Scrooge will send him off to the butchers after having some sort of night-time revelation and he's been told he's not allowed to go home until he's fetched a goose for someone. It's a hard life being an urchin. Our lad seems to come from the proud tradition of poor sellers of flowers from baskets that populate an awful lot of Victorian art. I suppose they count as 'the good poor', those people who are poor but will obviously work. But, you know, they are still poor because that's what they are. But at least they can be comforted by the fact that they are the good sort of poor. That must cheer them up no end. 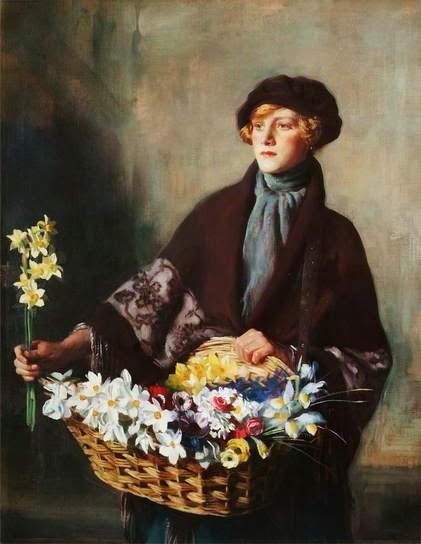 I think there is a feeling in images of flower sellers that they exist in a very fragile state of respectability. Usually they are women who spend all day on the street earning money. Now, it obviously wasn't a big jump in some people's minds between that and another profession. Moving on. To be reliant on nature for your money, your survival must have seemed uncertain. 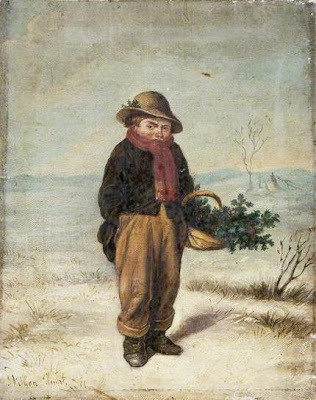 The little boy who has gathered a basket of holly is not doing it for fun. He looks quite hacked off and the weather looks bitter but he has to collect and sell holly. You begin to wonder if he is the breadwinner. Maybe he has no father and he alone has to support his twelve sisters and alcoholic mother at Christmas. Only the resilience and resourcefulness of a seven year old in rolled up trousers stands between the family and starvation this Christmas. This time of year brings back especially bad memories for the poor little mite as his father was pecked to death by an enraged goose last year. True story. Heart breaking stuff. I'm not sure how many people the little chap is hoping to sell to as he seems to be in the middle of nowhere, without even a dead sheep for company. Possibly business sense isn't his strong point. The future of his family is looking less certain and I strongly suspect it might only be gin for Christmas dinner this year. If they can wrestle it out of Mother's hands, that is. Thanks for the comments Ellie. I loved Kitty, she does look very method, doesn't she? As for the holly urchin, I think he came across his greenery under suspicious circumstances. That's the poor for you.